Everest Panorama Trekking is a popular short family and amazing scenic holiday in the Khumbu region of Nepal. Every year, a thousand visitors are visiting Everest region and all travelers to get insight into traditional Sherpa culture and their lifestyle with huge opportunity to explore beautiful Himalayan views of world's highest peak Mt. Everest and along with neighboring stunning Himalayan peak like Lhotse, Nuptse, Amadablam, Kwangde, Kategna, Thamserku and other unique and beautiful mountain peak. This trekking is most popular among the short hikers, no time enough and unable to go all the way to Everest base camp but wishes to see the world highest peak of Mt. Everest and to explore the wonderful Sherpa culture and traditional Himalayan lifestyle. Everest Panorama Trekking will complete in 11 days including your arrival and departure day. This is a fully customized itinerary package, come with fixed departure. The best seasons to visits Everest Panorama Trekking are spring (March-May) and autumn (October- November). This unique and an amazing Trekking will lead, our English speaking mountain experience and professional guide. We have a wide experience of Himalayan trekking in Nepal and have been providing best quality service in the tourism industries and Everest area and we also offer affordable and reasonable cost in the package for all. According to our package, we provide the best hotel accommodation in Kathmandu to Himalayan and necessary permits. All client are very satisfied with our best quality service, you can read all review and feedback in the Trip Advisor and website. This is the only article for all, if you want to see our service then come and try once. 11 days Everest Panorama Trekking itinerary package starts in the morning with a short scenery fly nearly 40-minute flight from Kathmandu and landed in Hillary airport at Lukla. There is no road access to Lukla, only by airplane and 5 days walk from Jiri. We will start to walk through Sagarmatha National Park, heading to Phakding village and an easy trekking in Everest reason as we will not climb higher elevation. This Trekking relatively easy and continues through whereas we can learn and explore the alpine forest, beautiful birds, Himalayan legendary Sherpa traditional culture, and their lifestyle. We will cross the calm river and get neighboring peaks and another beautiful mountain. This Trip is a truly unique, magical and beautiful Himalayan lifetime experience. Airport and hotel transfer as per the itinerary. Twin sharing three-star category accommodation in Kathmandu with breakfast in a standard hotel. All grounded transportation as per the itinerary. Airfares (Kathmandu- Lukla- Kathmandu) with airport departure taxes. Full board meals (dinner, lunch, and breakfast) with best available lodge accommodation during the trek. English speaking professional and friendly trek leader with assistant guide and porters (we assign 2 trekkers- 1 porters and 6 trekkers- 1 assistant guide) during the trek. All staff insurance, foods, accommodation, salary, transportations, and equipment. Everest region permit and TIMS card for trekking. Official service charge and taxes. Dinner and lunch in Kathmandu. Your travel insurance (it's compulsory). International airfares (to and from Nepal). Extra night accommodation in mountain and Kathmandu. All personal expenses (trekking gears, bar bills, battery charge, phone calls, alcoholic). Any shortest sightseeing and monument entrance fees (it is not included above cost include section). Tips (guide, porters, and drivers). Any other expenses which are not listed at cost include section above. Day 01Arrival in Kathmandu (1345m)Arrival in TIA airport in Kathmandu, you will meet with our representative, who will receive you and drive to Hotel, in Afternoon will be at leisure. You will get the pre-trek briefing, introduced to your trek leader. You will enjoy the evening dinner and pleasant stay in a Hotel in Kathmandu. Day 02Flight to Lukla (2810m) Trek to Phakding (2652m) After breakfast in the morning, we will take a short flight nearly 40-minute from Kathmandu to Lukla airport, then we start our Everest region trek. And Kwangde peak climbing trek begins at Lukla. During the flight east to west we will see magical views of different Himalayan Mountain peak like as Mt. Kanchenjunga, Mt. Lhotse, Mt. Nuptse, Mt. Makalu, and also we can get close- up view of Gaurishankar, Langtang and many other beautiful Mountain peaks throughout the flight. After landing we will meet our other crew members and before some packing and starts trek we may take a rest, we will begin our trek through the Lukla until Phakding. We will walk along the bank of Dudh Koshi river and will be head toward the Phakding village. After Phakding we don't hike up and stay at the guesthouse. Day 03Trek to Namche Bazaar (3446m)On this day, after hot breakfast, we begin walking along the Dudh Koshi. We cross Dhudh Koshi by Hillary suspension bridge, Beautiful pine forests, river sounds, and might see some of the wild animals too. We toward Namche Bazaar via forests of blooming rhododendron and reach the top of the ridge, offers beautiful views of Mt. Everest, Nuptse, Thamserku and Kusum Kanguru mountains. Finally, we reach the Namche Bazaar, known as a rich Buddhist culture and the home of Sherpa people as well. Where some shop and traders are selling Jewelry and handicrafts from Tibet and also their own local product like Potato, wheat, maize, millet etc. We will check into a local guesthouse and stay in Namche Bazaar. Day 05Trek to Khumjung (3780m) Today after breakfast in the morning we start hiking further up to Khumjung, is spectacular Sherpa village situated at 3780 meter above sea level. This day offer you explore rich and unique traditional Sherpa culture insights with very beautiful view of Khumbila peak and other popular surrounding snow capped high mountains then we can see beautiful simply and awesome Himalayan panorama views that takes our breath away. We also hike for side trip and explore to government Yak farm and airstrip in Syangboche, Khunde Hillary Hospital and School, Khumjung Gompa and other beautiful Sherpa settlement village. We will check in to a local guesthouse and have a pleasant stay at guesthouse in Khumjung village. Day 06Trek to Phortse Village (3810m) 6 hrs walk via Mong la Trek begins through the beautiful old Sherpa village, traditional Sherpa lifestyle and awesome Himalayan range and other beautiful mountains. Its takes nearly 6 hours from Khumjung village to Phortse village via Mong la- Birthplace of Lama Sange Dorje, where we can learn and observe to his life, settlement village of Phortse Tenga village and other beautiful Sherpa settlement village, monasteries and lifestyle of Himalayan people. We cross the Dudh Koshi River and get the Phortse village then we will check in to a local guesthouse and have a pleasant stay at guesthouse in Phortse village. Day 08Trek to Monjo (2835m) 6 hrs walk This day, we trek down to Monjo through the lush blue pine forest via Phunki Tenga village. We descend continue along the Namche Bazzar, Jorsale Thumbug and Sagarmatha National Park. 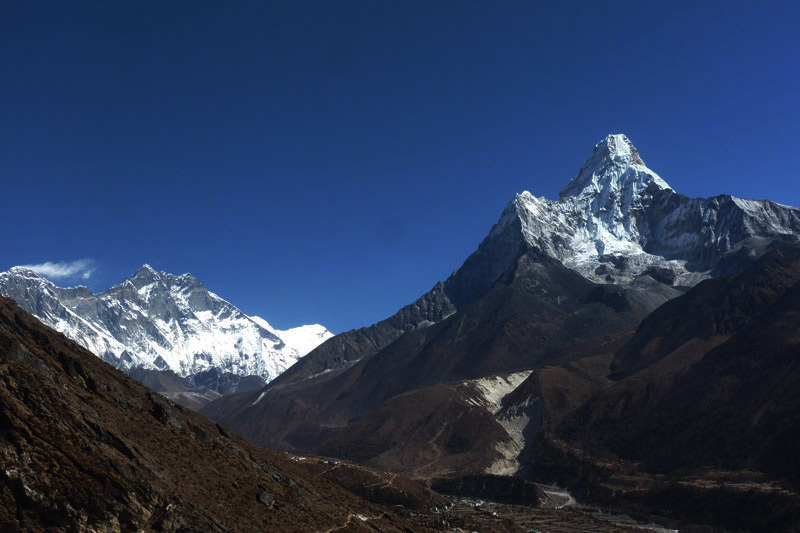 Here are we can get close- up view of Ama dablam, Lhotse, Kangtaiga, Thamserku. After continue descending to Monjo, we can see Tenzing Norgye Memorial stupa and Syangboche panorama. After 6 hours walk, we get the Monjo and check in to a local guesthouse and have a pleasant stay at guesthouse in Monjo. Day 09Trek to Lukla (2840m) around 6 hrs walk After having hot and delicious breakfast in the morning, we will cross the Monjo River. After walking along few tea houses, we cross the forest of blooming rhododendrons and get Lukla through Phakding, Nurning, Chheplung, Thalsharoa and other beautiful stupa and places. It takes 6 hours of trek to reach Lukla from Monjo and have a pleasant stay at guesthouse in Lukla as we will return to Kathmandu on the next day. Day 10Flight to Kathmandu Early in the morning having breakfast, we take short flight nearly 45 minutes to Kathmandu from Lukla airport. Important thing, sometimes flight will be delay because of weather conditions but you do not worry about it. We can safely flight back to Kathmandu, and then our representative will transfer your hotel and refreshed and then rest at the hotel and overnight at hotel. Day 11Final Departure This is the last day of your package. You will be assisted with your last moment preparation and dropped at TIA, Kathmandu from where you will board the flight to your next destination.